Kungfu4less.com is an ideal destination for people looking for martial arts Escrima sticks. 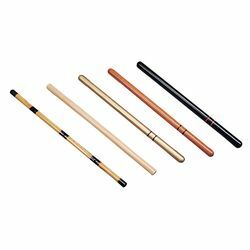 Different varieties like Rubber Escrima Sticks, Rattan Escrima Sticks, Grip Escrima are available for martial arts participants. The products can be purchased at cost effective prices and are of excellent quality. Escrima is a martial art which originated in Philippine islands. It emphasizes on a stick or short sword-based combat. A stick or yantok is the implement of choice, used in this martial art. Made from wood and rattan, they are generally light and strong. Usually, Escrima training first starts with mastering stick fighting and then moving on to hand-to-hand combat. If you are looking for premium quality Escrima sticks like Rubber Escrima Sticks, Rattan Escrima Sticks, Grip Escrima, White Wax Escrima Sticks, Leopard, then you are in the right place. We are able to offer a wide variety of different types of martial arts products at reasonable prices. Keep in mind, the main focus of our site is to aid people who are pursuing martial arts training in getting the right equipment at the best prices.